By State and Federal law, your cat does need to stay with us in strict radioactive isolation for approximately one week. The reason your pet must stay in isolation while here is that they are radioactive. This radioactivity reduces to a safe level for the general population within one week. While here, one of our trained staff will be acting as a ‘surrogate mother’ to your pet. This staff member has been trained in radiation safety and can be in the isolation room with your cat. A blanket or towel for the cat. This is not returnable to you however. Your cat’s favorite food or treats as long as they DO NOT contain fish or fish oil (these interfere with the iodine uptake by your pet’s thyroid gland). Any leftovers are not returnable to you. TV/VCR with a variety of kitty favorite videos. Upon release, you will be given detailed instructions on how to handle your cat. These are very easy to do. Your pet does have a very low level of radiation for approximately 2 more weeks. The amount of radiation is equal to the amount spent at a day at the beach. The potential risk to you is very remote but these rules required by State and Federal Radiation laws. Limit (not stopping) snuggling with your cat for 2 weeks post-treatment. Must stay indoors for 2 weeks post-treatment. Wash your hands after handling your cat for 2 weeks post-treatment. 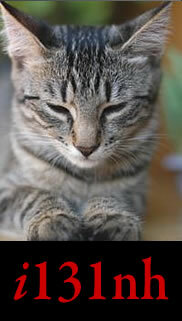 We recommend that pregnant women not participate in their cat’s care for 2 weeks post-treatment. After two weeks, you can treat your cat normally. Please click here to view information about your pet's i131 treatment. Please click here to view some frequently asked questions you might have about the process.